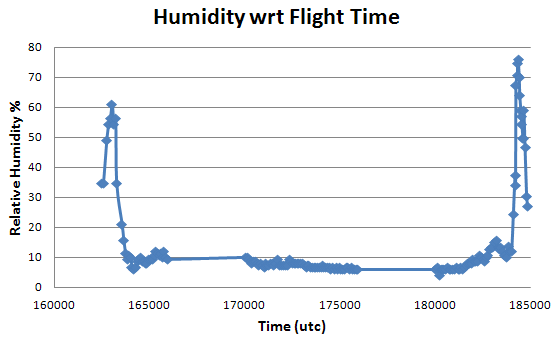 I thought it'd be interesting to slap on a humidity sensor to measure atmospheric humidity during the flight. Where would humidity be higher: below, at, or above the clouds? 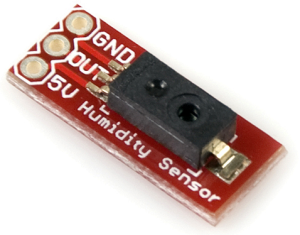 The sensor I used was the $17 analog HIH-4030 Humidity Sensor sold as a breakout board from Sparkfun. It is 5V-only compatible so I couldn't use it with my 3.6V setup using the Axon Mote, but thankfully Nick had a spare ADC port and EEPROM on his 5V mcu setup. With only three pins - ground, 5V, and output - it couldn't get much simpler. The humidity sensor datasheet has a calibration for temperatures between 0C and 25C. However the sensor had experienced temperatures ranging from -40C to 40C. I did my best to match up the calibrations by rounding the temperatures to the closest calibration temperature. You can find more information and my calibration in the data file below. I plotted the data in two ways. First, I plotted it with respect to time: the balloon went up, hovered, and finally came back down. You'll see humidity spike on each end of the graph, representing both times it passed through clouds. 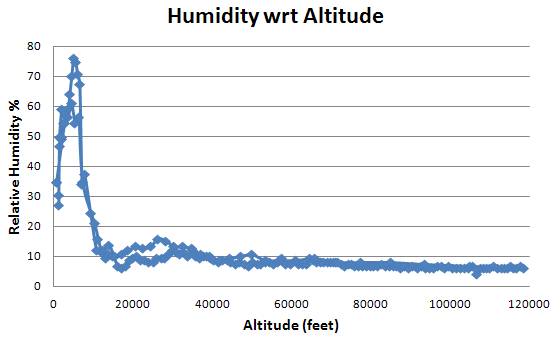 In the second graph, humidity is plotted with respect to altitude. Altitude was measured by GPS for both graphs. Click each image to see an enlarged chart. Looking at the data, you'll see that relative humidity is about 30% at ground level. It then spikes at around 3,500 feet, which generally is the altitude of the clouds of that particular day (see image at top of this page). And then you'll see humidity quickly drop to ~9% at around 16,000 feet, and then slowly drop further from there. "A cloud forms when air heated by the sun rises like a balloon. As it rises, it slowly cools until it reaches the saturation point and water condenses, forming a cloud. As long as the cloud (and air its made of) is warmer than the outside air around it, it 'floats.'" In other words, my experiment measured that saturation point to be at approximately ~5.5k feet. The majority of atmospheric humidity is held within the clouds and not at ground level. This is obvious to most of us, but still neat to be scientifically proven and graphed quantitatively. A data dump can be found in the space data downloads section.